There are a few minor downsides but the MiniNova's depth and sound are killer for the money. Very well built and super-portable. Punchy upfront sound with deep editing. There's a lot onboard for the money. Novation's latest synth has obviously been inspired by the microKorg but at its heart lies the sound engine and majority of features from the Ultranova, which means that patches can be shared between the two. "The MiniNova takes the Ultranova concept further but loses the audio/midi interface"
The Ultranova is well regarded for packing a very deep synthesiser engine into a compact space and the MiniNova takes this concept further but loses the audio/midi interface. The three-octave full-size Ultranova keybed has been replaced by a three-octave mini keyboard. 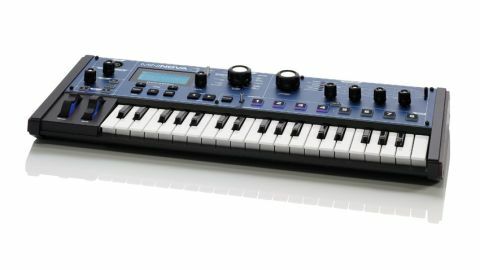 The whole package is light enough to pick up with one hand and the keybed feels much the same as the original microKorg. However, it's too stiffly sprung for truly expressive playing and it lacks aftertouch. It's a shame a similar keybed to the one in the microKorg XL couldn't have been used, after all they are at similar price points. Also note that the MiniNova doesn't take batteries, though it can be USB powered. The rest of the interface is a fair compromise bearing in mind the amount of space available. The pitch and mod wheels are a good size for a small instrument and are backlit bright blue (the lights can be turned off if needed). Perhaps the pitch bend could have been made a little less floppy in action and, while the octave up and down switches always help on a keyboard of this size, we wish they would change the sound immediately when holding a chord or note down, like on many analogue synths. "All the dials have little play in them and should stand up well to finger abuse"
Build quality is great for the price and the switchgear feels tough with Minimoog-inspired dials for volume, data and for accessing the performance matrix on the right of the front panel, supplemented by a large filter cutoff and genre select dial. All the dials have little play in them and should stand up well to finger abuse. In the middle of the panel the microKorg XL-inspired genre dial sorts sounds into genres for quick selection. You can scroll through sounds in each genre using the tough rubber patch buttons, or scroll through all 256 (+128 user) onboard sounds one by one when the dial is in the 'all' position. Patches can also be sorted by number or alphabetically using the metal flick switch. Genres include Rock/Pop, RnB/ HipHop, Dubstep (again like the microKorg XL+!) Classic Synth, bass, leads and more. The white on blue display is similar to the Impulse range of controllers and does a good job of relaying the often-large amounts of info clearly. Bearing in mind how deep the sound engine is, the system of screen, menu/ page buttons, data wheel and patch select buttons does an admirable job and it's easier to get to grips with than the cryptic system implemented on the first MicroKorg. There's still a lot of page scrolling and button pressing involved when editing but once the editor is available this should speed things up considerably. The Ultranova's editor is excellent so we have no doubt the MiniNova's will be of a similar design when it's launched (which will hopefully be soon)! Looking further into the front panel design, the 6x4 performance matrix with four dials works well from a performer's point of view. You simply switch the slider to the line of performance parameters you want to edit and turn the corresponding dial. Functionality of these controls can change depending on the patch selected and the first two rows of parameters (called 'tweaks') can be user assigned. Most of the key parameters you would wish to access or assign are available here from ADSR's for filter and amp, to FX levels, drive, oscillator sync and filter resonance/type. Just above the keyboard are eight rubber buttons that can be used for 'animation' (as on the Ultranova) for muting in and out any of the eight steps when using the arpeggiator, or as eight favourite sound buttons. The flick switch flips between either 'animate' or 'arpeggiate' and the animation function is probably our favourite aspect of the MiniNova's design as you can assign any of the vast number of mod functions/parameters to these buttons to augment your performance. We wish this system was implemented on other manufacturers keyboards as it really does open up the performance side of things. The 'hold' button allows you to keep the animation held at any desired level when performing, so if you stumble upon a great filter setting you can capture it and carrying on playing with both hands. Neat! "If you like designing sounds then the MiniNova is hard to beat and it's eminently tweakable"
The MiniNova's sound engine is lifted directly from the Ultranova and is deep to say the least, though it's worth bearing in mind that it's mono-timbral, so no assigning of different sounds to different Midi channels or splitting/ layering of sounds for playback from your DAW/sequencer. Max polyphony is decent at 18 notes and this trumps the MicroKorg XL's 8 notes, though let's not forget the MicroKorg XL is two-part multi-timbral, allowing basic splitting and layering. If you need splits and layers then maybe this isn't the synth for you but having said that, there's a staggering array of parameters to work with when editing and tweaking the patches. If you like designing sounds then the MiniNova is hard to beat and it's eminently tweakable, plus the presets only show a small snapshot of what this board is really capable of. Certainly they're catered towards harder electronic styles rather than softer and more acoustic tones and it's obvious Novation want to sell this board to producers of Dubstep, House, Techno and more contemporary glitch styles rather than those wanting uber-realistic acoustic patches. In fact, it's almost impossible to find a convincing acoustic piano, Rhodes, guitar or string section emulation within the presets which is a shame, though the MiniNova is capable of pulling these kind of tones out of the bag with a bit of programming. Each sound (patch) can have up to three oscillators with square, sine, tri, sawtooth, pulse and nine different saw/pulse combinations. You can also select from 20 digital waves, 36 wavetables, a noise generator and two ring mod generators. The analogue-style oscillator waves sound great, with a wide frequency range and plenty of punch; they're perfect for aggressive upfront electronica, which is the MiniNova's intended market. There are also six envelopes onboard with various trigger options. Envelopes one and two are hard wired to amp and filter as expected but three-to-six can be freely assigned to any parameters, allowing the creation of extremely complex patches and evolving soundscapes. The envelopes are pretty snappy too, so it's easy to sculpt punchy attacks for powerful basses, cutting leads and tight percussive sounds. "External signals can also be processed through the filters and by an envelope follower which is real bonus"
When it comes to filtering, the MiniNova is no slouch either. There are two main filter blocks that can be balanced against each other using a balance control, plus they can be placed in series, parallel, one at a time, drum mode, or bypassed completely. The best bet here is just to try them all out and you'll quickly get a feel for your favourite modes and combinations. Not only this but external signals can also be processed through the filters and by an envelope follower which is real bonus. There are 14 different filter types available including low-pass, high-pass, band-pass, high-pass without resonance and several variations thereof, including 12dB, 18dB and 24dB slopes. The filters sound very respectable in general, with smooth almost step-free resonance and cutoff response and, although the general tone errs more towards hard electronic rather than warm juiciness, the MiniNova is perfectly capable of warmer tones with a bit of tweaking. On price and features alone, you'd be crazy to ignore the MiniNova. Though it has a lot in common with Korg's microKorg series in terms of overall design aesthetic, the sound engine sounds completely different and runs far deeper in just about every respect, though it does miss some more natural acoustic instrument samples. Also, while the reverb and effects aren't the greatest and the vocoder isn't as clear as we would have liked, there is enough to keep most people hooked for a long time and at the price you can forgive these small shortcomings. If you're into electronic music with a tough edge, love deep sound design and need something that's super-portable yet well built at a reasonable price, then the MiniNova is very appealing.